Dr. Di Brandt is an internationally renowned, multiple award-winning poet, author, essayist and literary critic. Her poetry titles include the acclaimed, bestselling questions i asked my mother, recently re-issued in a 30th anniversary tribute edition with Afterword by Tanis MacDonald; Agnes in the sky; Now You Care; Walking to Mojácar, with French and Spanish translations by Charles Leblanc and Ari Belathar; and most recently, Glitter & fall: Laozi's Dao De Jing, Transinhalations (Turnstone Press 2018). Her critical work includes So this is the world & here I am in it and the award-winning critical anthology, Wider Boundaries of Daring: The Modernist Impulse in Canadian Women's Poetry, co-edited with Barbara Godard, with Introduction by Di Brandt. 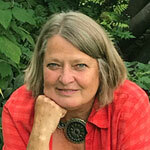 Di Brandt has received numerous award for her work, including the Gerald Lampert Award for "best first book of poetry in Canada," the McNally Robinson Award for Manitoba Book of the Year, the CAA National Poetry Prize, and the Gabrielle Roy Prize for "best book of literary criticism in Canada," with Barbara Godard. Her poetry has been nominated for the Governor General's Award (twice), the Dillons Commonwealth Poetry Prize, the Griffin Poetry Prize, the Trillium Ontario Book of the Year Award and many other recognitions. Wider Boundaries of Daring was shortlisted for the Canada Prize in the Humanities. Di Brandt has also collaborated with numerous artists working in other media, including composers Carol Ann Weaver and Rebecca Campbell, Jana Skarecky and Ken Nichols. Di Brandt has held research and writing positions at the Universities of Alberta, Manitoba, Windsor (ON), Brandon (MB), and is delighted to have returned to the University of Winnipeg where her academic career began. She has held guest lectureships and fellowships, and given lectures, readings and creative writing workshops around the world, including across Canada, the US, England, Germany, Spain, Denmark, Switzerland, Austria, Scotland, Japan , the Middle East and Colombia (SA). She is currently serving a two-year term as Winnipeg's inaugural Poet Laureate. "Di Brandt's evocative, moving cosmology carries us along like a river. Stored and storied inside the tonal images, sounds, pauses and very structure of the poems is a deep spiritual knowing/knowledge. Drawing on the ancient wellspring of Daoism and fully engaged with her present, Brandt shows us with sage attention that poetic language is capable of conveying he deep measure of the spiritual: "The Spirit enters even where/there are no openings." Di Brandt is the multiple award-winning author and editor of numerous books of poetry, literary criticism, creative essays, and fiction. Her first book of poetry, questions i asked my mother, a bestselling book and media sensation and the first book by a woman from the southern Manitoba Mennonite Reserve, was recently re-issued in a 30th anniversary tribute edition, with Afterword by Tanis MacDonald (Gerald Lampert Award for “best first book of poetry in Canada”). Now You Care was shortlisted for the Griffin Poetry Prize, the Pat Lowther Award for “best book of poetry by a woman in Canada,” and the Trillium Ontario Book of the Year Award, and was also much celebrated in the Canadian media. Her most recent collection, Walking to Mojácar, with French and Spanish translations by Charles Leblanc and Ari Belathar, was shortlisted for the McNally Robinson Manitoba Book of the Year Award. Her critical anthology, Wider Boundaries of Daring: The Modernist Impulse in Canadian Women’s Poetry, co-edited with Barbara Godard (Avie Bennett Chair in Canadian Studies at York University), received the Gabrielle Roy Prize for “best book of literary criticism in Canada,” and was shortlisted for the Canada Prize in the Humanities. Her first book of literary criticism, Wild Mother Dancing: Maternal Narrative in Canadian Literature, is credited with inspiring the creation of ARM (Association for Research on Mothering, at York University) and its related publications, the Journal for Research on Mothering, and Demeter Press. Di Brandt has also collaborated with numerous artists in the creation of multimedia works, including the poetry/song cycle Awakenings: In Four Voices, with singer/songwriters Rebecca Campbell and Carol Ann Weaver and poetry by Dorothy Livesay; the opera Emily, the Way You Are, about the life and works of Emily Carr, with composer Jana Skarecky; the poetry/art chapbook SHE: Poems Inspired by Laozi’s Dao De Jing, with artist Lin Xu; and the song cycle Coyotes Do Not Carry Her Away, for soprano, clarinet and harp, with composer Kenneth Nichols. She has hosted numerous symposia and festivals including the OGAMAS National Aboriginal Literary Festival and the Manitoba Mennonite Creative Arts Festival, both at Brandon University.